In this ten day class, students will learn the fundamental tools they need to succeed in today's floral marketplace. Lectures are followed with demonstrations and 'hands-on' practice. Phil believes, "If you hear it, you see it, you do it, and you will retain it." Covered topics are basic design elements and principals along with color theory, flower identification, care and handling; flower shop operations, sales and 'pricing for profit'. 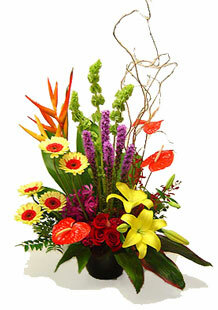 Instruction of arrangements for Sympathy, Wedding, Special Event and current design styles are taught. Basic Design Principles, i.e. balance, harmony, proportion, depth, and dimension, rhythm, etc. Exploration of the color wheel - color harmony, color psychology, monochromatic schemes versus contrasting or complimentary color schemes. Basic material usage - mediums, working mechanics, design aids and accessories. Preparation and care of cut flowers - various preservative, special conditioning, storage and vase life. A flower usage presentation - the varied uses of an individual flower type. Production design, designing for profit. Unique concepts and techniques of the Rulloda design theory for practical application and daily usage. Basic design shapes for every-day use in commercial floristry. Sympathy tributes for all ages - set pieces, slumber room arrangements, flat and casket pieces, lid settings, easel sprays. Current sympathy trends in the floral industry. Basic corsage preparations and designs, stemming and wiring techniques, bow and ribbon treatments. Special presentation of unique and contemporary personal flowers. Wedding Work - the wear and carry pieces for both the traditional and contemporary bride.